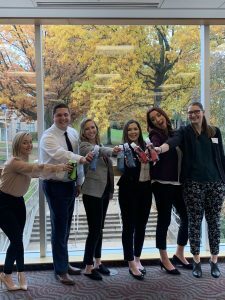 St. John Fisher College’s Chapter of the American Marketing Association hosted their first regional conference on November 3rd, 2018. The conference had about 40 attendees from schools throughout the Western New York area including Niagara University, Ithaca College, and RIT. Karma Water, a local company based in Pittsford that specializes in flavored wellness water, sponsored the event. The American Marketing Association has 11,000 student members across 370 AMA collegiate chapters. It is an essential community for aspiring marketing professionals that provides more ways for marketers and academics to connect with the people and resources they need to be successful. After attending AMA’s annual International Collegiate Conference last April and receiving the award for a Top 20 Chapter, SJFC AMA decided it was time to host their own conference. The conference included two guest speakers, a case competition, and a networking event with breakfast and lunch provided. Sarah Pare from Constellation brands spoke about her work as a Corporate Strategy Manager and taught attendees about creating value for customers while working for a major company. Tommy Brunett shared his story about being a singer/songwriter while working on various marketing ventures before eventually opening up his own whiskey distillery called Iron Smoke Whiskey. Seven teams participated in the case competition, which asked participants to create a marketing strategy for Karma Water. The winning team from Niagara University received $300 along with a three months supply of Karma Water. The second and third place teams from St. John Fisher received $200 and $100 respectively. Past alumni returned to SJFC to participate in the networking event. Majority of them work at companies and agencies right here in Rochester and were able to give advice on upcoming interviews as well as tips on how to find the perfect job. Overall, the event received well-deserved positive feedback from those who attended. This first conference was a huge success and our chapter of AMA plans to hold another one next year. Congratulations to all who worked to make the event possible and thank you to all of those who attended. Posted in Uncategorized and tagged AMA, conference, constellation brands, iron smoke whiskey, marketing, networking, regional, regional conference, SJFC, sjfc ama.